If you need to cater for vegans over the festive season, try Karen's showstopper main course pithivier which is sure to please. 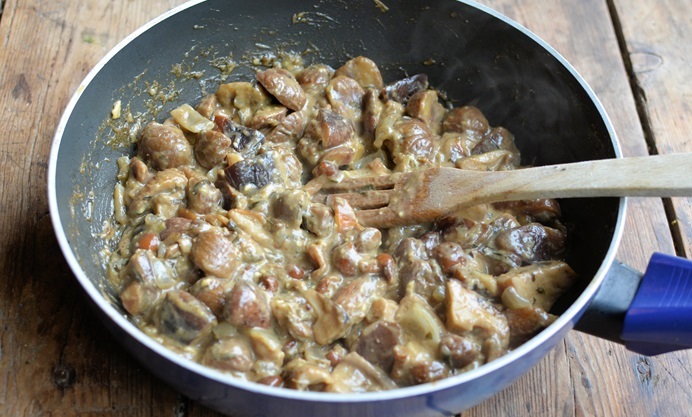 Filled with chestnuts, mushrooms and thyme, carnivores will be jealous of what's on offer. Christmas is not far away now and I was thinking about alternative main course recipes the other day, as two of my dinner guests on the big day are vegan; now, I can cope with vegetarian recipes, I was vegetarian for about five years and my mum and sister are also veggie, but I have never had to cater for a vegan guest before, so I rose the challenge to create a fabulous “showstopper” style main course that will tempt, excite and please. Looking over the channel to France and remembering an article I read about most prepared “shop-bought” puff pastry being suitable for vegans, I decided to make a “Pithivier” which is essentially a French puff pastry pie. 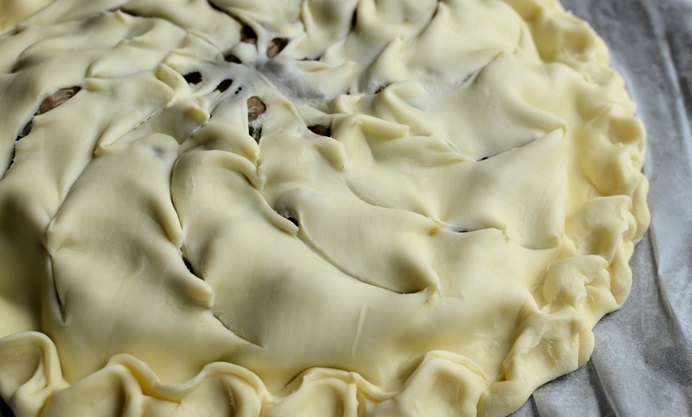 A Pithivier pie is always round and has an attractive “sunbeam” pattern cut into the pastry lid before baking which gives it the distinct pattern that makes it a Pithivier pie. It is commonly assumed that pie got its name as it originated from the town of Pithiviers in Northern France, and having been there, they certainly had a lot of Pithivier pies on sale, so maybe it’s true! 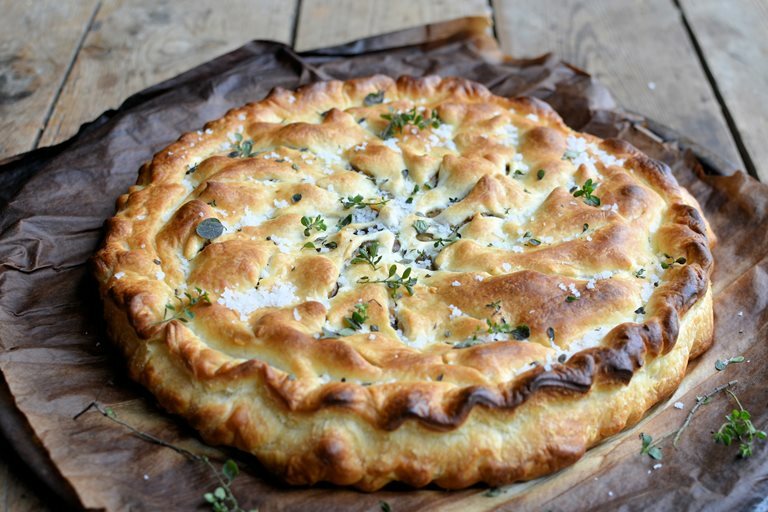 My special recipe for Vegan Mushroom, Chestnut and Thyme Pithivier turned out so well that even the carnivores want a slice of pie too…..which is always a good sign when food is so tasty despite its dietary or culinary genre. I used a bag of mixed frozen mushrooms that included shitake, chanterelles and chestnut mushrooms with a few other varieties added for colour, shape and texture. I know that you can also buy these mushrooms in tins too, which is handy to know as a tin of these in the pantry will be a godsend over the festive period for vegan or vegetarian recipes. 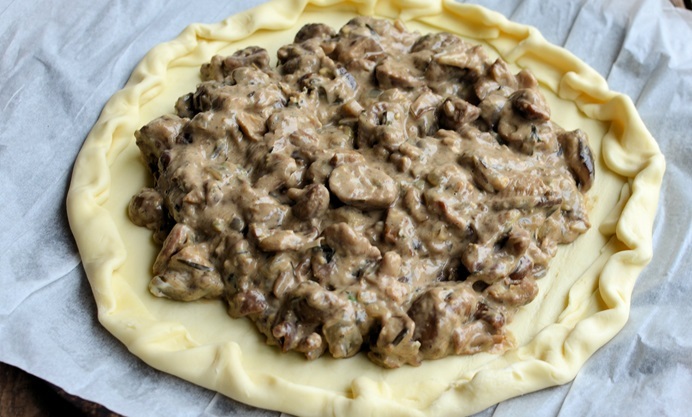 As well as the mixed mushrooms, the filling has shallots, garlic, chestnuts, Madeira and fresh thyme in it which made for a very decadent and rich pie that has all the right attributes for a special celebratory meal. 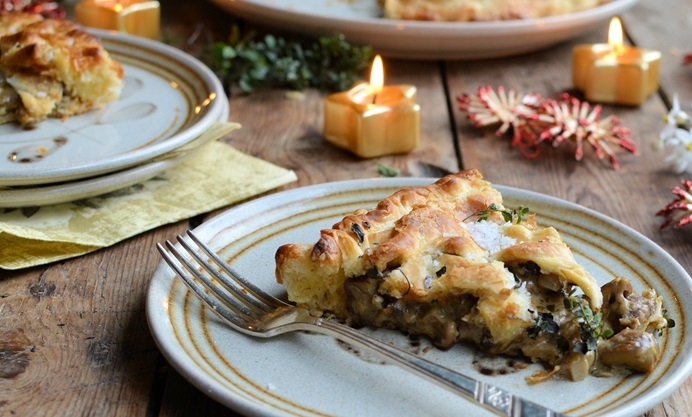 Serve this pie with all the usual trimmings such as cranberry sauce, stuffing and vegetables for a delicious and special vegan main course that will be just as tempting to everyone else at the Christmas dinner table! NB: DO check that the puff pastry is vegan - I used Jus Rol Puff Pastry Ready Rolled which is suitable for vegans and vegetarians.